Founded in 1928, the Houston Polo Club is an established institution recognized for excellence in the sport of polo and equestrian pursuits. Celebrating its 86th Anniversary year, the club is Houston’s oldest sports franchise. Like Houston’s other athletic pursuits, the Houston Polo Club continues to produce top athletes in their sport. Much of the credit is owed to polo instructors Mark Prinsloo and Barlee Flanders and their successful polo school. 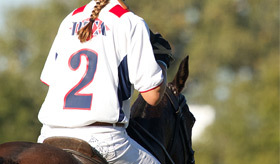 In both the Spring and Fall, the Houston Polo Club offers a polo school. During the eight week program, individuals who have never played polo learn everything necessary to participate in a match. Even students who have never ridden are able to participate in the program with a little prep work in riding lessons. The school also often serves as a refresher course for anyone looking to brush up on their skills. The course touches on important elements of the game including; swing technique, proper riding and game strategy. For additional information and schedules on upcoming polo clinics and schools, email us atevents@thehoustonpoloclub.com.